A trailer for a new documentary titled "The Creepy Line " came across my email. After discovering the documentary is already out on Amazon and if you have a Prime membership, it is included for free, I thought I would share this valuable resource with readers. Not only does Google and Facebook influence what we might purchase via advertising, but they seek to influence how we think and even vote. The film by M.A. Taylor and Peter Schweizer, which premiered Sept. 17 in New York and Sept. 19 in Washington, coincided with President Donald Trump’s executive order tasking federal agencies with examining online platforms for bias and antitrust issues. Taylor is passionate about the freedom to vote without manipulation. On the website for the documentary, several articles are posted about what Google knows about you and what Facebook knows about you. Back in April, I reported on manipulation of search engine results and other means of manipulating data that is censored while other information is pushed. However, a new report is out that shows that Google’s search manipulations could swing nearly eighty percent of undecided voters. The report was written by Robert Epstein, Roger Mohr, Jr., and Jeremy Martinez of the American Institute for Behavioral Research and Technology. A series of randomized, controlled experiments was conducted to quantify the power that search suggestions (sometimes called autocomplete suggestions) have to shift opinions and voting preferences. The investigationsuggests that (a) a search engine has the power to manipulate people’s searchesfrom the very first character people type into the search bar, (b) negative (“lowvalence”) search terms can attract 10-to-15 times as many clicks as neutral or positive terms can (an example of “negativity bias”), which means that a simpleyet powerful way for a search engine company to manipulate elections is tosuppress negative search suggestions for the candidate it supports, while allowingone or more negative search suggestions to appear for the opposing candidate (the“differential suppression of negative search suggestions”), (c) the optimal numberof search suggestions for manipulating opinions is four, which was the defaultnumber of search suggestions Google showed people on laptop and desktopcomputers from 2010 until October 2017, (d) the higher a suggestion appears in alist of search suggestions, the more impact it has on search, and (e) overall,manipulating search suggestions can shift a 50/50 split among people who areundecided on an issue to a 90/10 split without people’s awareness and withoutleaving a paper trail for authorities to follow. We call the power that search suggestions have to affect opinions the Search Suggestion Effect (SSE). So, what did they discover? In a series of controlled experiments reported in the Proceedings of the National Academy of Sciences (PNAS) in 2015, Epstein and Robertson demonstrated the power that search results have to shift people’s opinions and voting preferences without their knowledge – up to 80 percent in some demographic groups. They labeled this phenomenon the “Search Engine Manipulation Effect” (SEME) (http://bit.ly/1REqzEY). That report has since been downloaded more than 94,000 times from PNAS’s website (http://bit.ly/2BCEFTW). The report demonstrates that by Google simply adding a positive or negative search suggestion regarding a particular candidate that it will affect the search results greatly, influencing potential voters. The voting preferences of participants who saw no search suggestions shifted toward the favored candidate by 37.1%. The voting preferences of participants in the search suggestion groups who saw only positive search suggestions shifted similarly (35.6%). However, the voting preferences of participants who saw three positive search suggestions and one negative search suggestion barely shifted (1.8%); this occurred because the negative search suggestion attracted more than 40% of the clicks (negativity bias). In other words, a single negative search suggestion can impact opinions dramatically. Participants who were shown four negative suggestions (and no positives) shifted away from the candidate shown in the search bar (-43.4%). 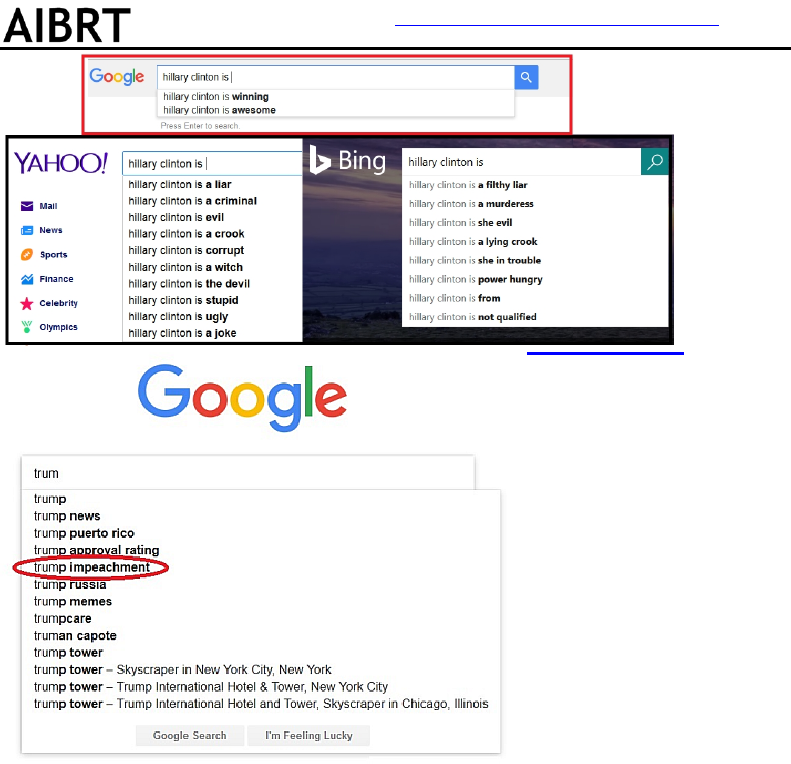 To demonstrate how this looks to the end user, take a look at these search suggestions provided by Google for Donald Trump and Hillary Clinton. The first came from October 2017 for the letters typed “trum,” and for the results for “Hillary Clinton is” are from August 2016. Note the difference between the search engine results of Google, Bing and Yahoo on the Clinton search! Influencing politics in this manner is far more devious and sinister than any Russian influence simply because Google is a US-based company that was funded by the Central Intelligence Agency. This can only be considered a sort of propaganda against the people of the united States. Epstein also conducted a similar report in 2015 and wrote about it at Politico, demonstrating that virtually nothing has changed since that time. Of course, if you can’t manipulate people to your candidate by search results and silencing opposition on social media platforms, there’s always the good old manipulating the electronic voting machines. In a response to that report by Epstein, The Epoch Times reports that Google said, "it didn’t seek to manipulate political sentiment, or make ranking tweaks' to search results." Of course, Epstein is like so many who don't think there is a conspiracy going on and Google is actively changing their ranks, but he says, "They have the power." If you're looking for election meddling and influence, look no further to Silicon Valley and big tech giants like Facebook and Google, not Russia.